Working on my New Year's resolution on actually doing stuff instead of just reading and writing about it. 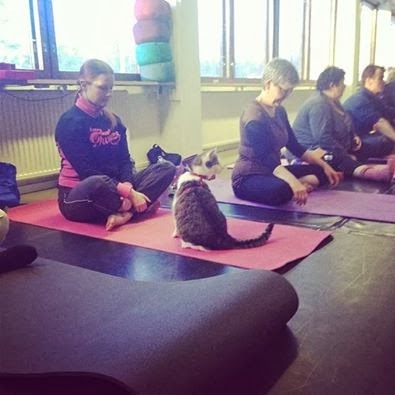 Yesterday I took part in the Yoga like a Cat event in Loviisa, basically you could pay as much as you wanted for the yoga and all the money went to the house for abandoned cats in the area. Very nice, I got acquainted with the Yasse the Cat during the Yin Yoga session. On the social side, we have met our good friend's who right now have the cutest puppies and I have been bowling with some friends as well as having a movie night with some others. Very nice to catch up with everyone! Also working on planning our garden for next summer, our living room might become a but overfilled during spring with small plantings, let's see how that develops. EDIT: I forgot to tell you that our after bowling cider was enjoyed at Teerenpeli bar in Helsinki which I do recommend. They have their locally made beer and cider as well as ecological ones. Who can resist blueberry or lingonberry cider anyway?